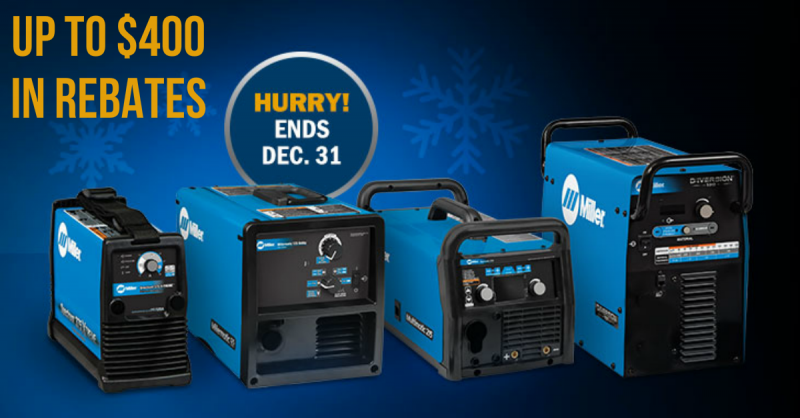 Archived Deals Miller Holiday Rebates up to $400 for Welders Plasma Cutters and Accessories. Miller Holiday Rebates up to $400 for Welders Plasma Cutters and Accessories. From now until the end of 2016, Miller is offering rebates from $50 to $200 on a selection of different Miller Welders and Plasma cutters. The lowest priced welder is their Millermatic 125 Hobby welder, which is priced at $499 after the $50 rebate. The prices go all the way to up $6,299 for the Miller Trailblazer 325 Welder/Generator after $200 rebate. In addition to the welder rebate, you can stack on anywhere from $50 to $200 in additional rebates if you spend between $150 and $500 on Miller and Hobart welding accessories.